The Temple of Venus Genitrice, the Temple of Minerva, the Temple of Vesta (all in the Roman Forum) are just some of the sacred buildings devoted to the Roman divinities that you can admire when visiting Rome. The whole city was dotted with temples and sacred places to go to pray to the gods to solve social, personal issues, thank them or make the necessary sacrifices. The Roman pantheon was mainly made up of divinities of ancient Italic origins, which, after the influence of other peoples, assimilated foreign gods, especially Greek ones. But how were these Roman deities? Like the Greek ones, they were imagined in human semblance and with life habits similar to those of men with personal stories that often clashed with them not only in love affairs, but also in warlike affairs. They obviously had over-the-top qualities and powers, but also the characteristic defects of men. They frequently argued and were jealous of each other. Below you will find a small list of the major Roman divinities, so that you will be able to be prepared when you visit Rome. King of Heaven and the founder of all gods. 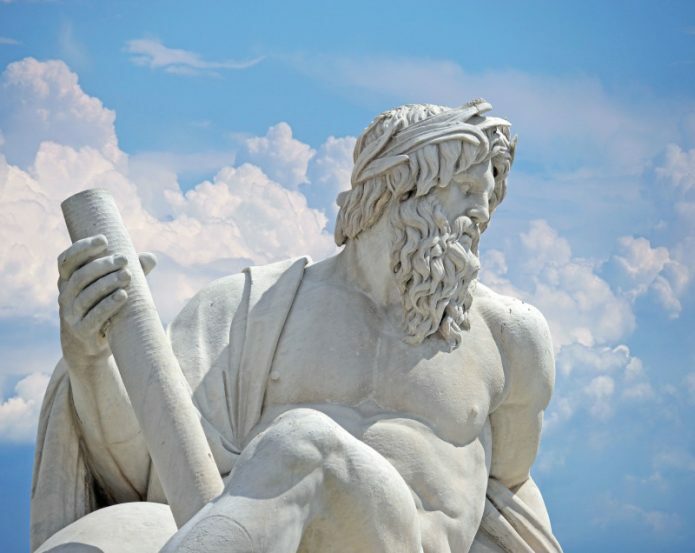 Juno’s brother and husband was famous for his extramarital adventures from which many heroes were born, such as Hercules, demigods and some monsters. His symbols were the lightning and the eagle (symbol, among other things, also of Rome). God of the sea and the earthquakes, was the brother of Jupiter and Pluto. Married to the Anfitrite nymph, lived in an underwater palace. He had four children from her, including Triton and Cimopolea. He was also the father of many more or less monstrous creatures, such as the legendary cyclops and the legendary Pegasus. His symbols were the trident and the horse, created by himself by the foam of the waves. Brother of Jupiter and Neptune, he was never welcome on the Olympus, so that he did not even have a throne in the gods’ residence. He controlled the Hells, where he lived. In Roman times it also became the divinity of metals, precious stones and everything that is under ground. He kidnappedr Proserpina, daughter of Ceres, and made her his bride. His symbol was the helm of Terror. God of war, son of Jupiter and Juno, in the Roman era he was very important. He was given the name of Ultore, the Avenger. Protector of the Empire, he lost his ferocious character, typical of the Greek form, to assume a more rigid and demanding personality. He was the lover of Venus, father of Phobos and Deimos. His symbols were the boar and the bloody spear. Juni’s son, when he was newly born was thrown down from the Olympus by his mother because he did not look good. God of fire, craftsmen and blacksmiths, he was married to Venus. His symbols were the anvil and the quail (which bounces along strangely, just like him). Diana’s twin was the god of music, poetry, medicine, archery, and bachelors. As the sister represented the moon, he was attributed to the sun. God of wayfarers, travelers, thieves, and messengers. He was the courier of the gods, son of Jupiter and Maia. His symbols were the the helmet. the winged sandals and the caduceo. Originally he was a demigod, son of Jupiter and a mortal, Semele, but after inventing the wine he was promoted to divinity by taking the throne of Vesta. He was the god of wine and festivities. The symbols were the tiger, the leopard, the grape and the thyrsus, a spear topped by a pine cone. Wife and sister of Jupiter, she was the goddess of women, marriage, maternity and fertility. Jupiter gave her a son, Mars, and a daughter, Iuventas, a goddess of youth. Her symbols were the peacock and the cow (a maternal animal). Goddess of Agriculture, sister of Juno and Vesta. Mother of Proserpina, her symbols were poppy and barley. Goddess of the household and home, gave up his throne on the Olympus to Bacco. She was a virgin and very humble goddess. In the Roman period, a group of priests who devoted themselves to the goddess took on a great deal of importance, thanks to the creation of the Order of the Vestals. Its symbol was a crane. She was the goddess of wisdom and minor arts. She was not much loved by the Romans, because she was the protector of the Greeks, their rivals. She was a virgin goddess born of Jupiter’s mind. Its symbol was the owl. Goddess of love born out of the blood of Uranus and the sea foam. She was given a wife to Vulcan, but it was well known that she was in love with Mars. From the union of the two, Phobos and Deimos were born, Fear and Terror. Her symbols were the dove and the magic belt that made anyone fall in love with her. Goddess of hunting, of virgin girls and of childbirth, later of the moon. She never married or had children. She was the twin of Apollo, the sons of Leto and Jupiter. At her service she had some aides, the so-called Hunters of Artemis, virgin girls under her protection.